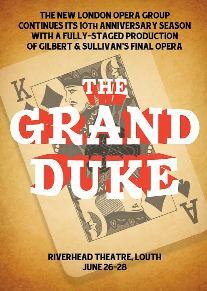 Welcome to the wonderful world of The Grand Duke, the 2014 summer production by the New London Opera Group. The show will have three performances at Louth Playgoers’ Riverhead Theatre in Lincolnshire from Thursday 26 June to Saturday 28 June at 7.30pm. The Grand Duke, first performed at the Savoy Theatre in 1896, was not a success in its original run and disappeared from the D’Oyly Carte repertoire until 1975, when it was given in concert format. But since then, helped by two very fine BBC recordings and a number of amateur stagings, The Grand Duke has entered the G&S repertoire and audiences have come to appreciate its particular qualities. Gilbert’s labyrinthine plot, concerning the attempts of Ernest Dummfopf’s theatrical company to overthrow the miserly Grand Duke Rudolph of Pfenig-Halbpfenig, contains many twists and turns, playing cards and roulette. And sausage rolls. Gilbert rides the popular wave of Ruritanian romantic comedy of the 1890s (Anthony Hope’s novel The Prisoner of Zenda had been published only two years before). For this production, the lengthy dialogue has been slimmed down. In contrast, Sullivan’s score, surely the closest he came to writing a “continental”-style operetta, absolutely sparkles with waltzes, marches and even a can-can. The production will be directed by Chris Cann and we are delighted to welcome back Alex Carpenter as Musical Director, following the great success of the Spring double-bill of The Contrabandista and Trial by Jury. Audition and rehearsal information is now available. Please sign up to our Facebook page for all the latest information!